In Section 2, Clause 2 of our Constitution -- known as the Appointments Clause -- our founders laid down clear instructions in the event of a Supreme Court vacancy: the President has the responsibility to appoint a justice any and every time there is an opening on the bench. And because of our system of checks and balances, that nominee must be confirmed by the Senate. The passing of Justice Scalia has placed this constitutional responsibility on President Obama, and he has pledged to fulfill it. The Senate must also fulfill its responsibility to grant his nominee a fair hearing and a timely vote. If we look at the historical record since at least 1900, there is no evidence of a president failing to nominate and/or the Senate failing to confirm a Supreme Court nominee in a presidential election year due to an impending election. In fact, in that time period, six justices were confirmed in presidential election years, the most recent being Reagan-appointee Justice Kennedy in 1988. In urging Congress to consider his nominee, President Reagan said: "Every day that passes with the Supreme Court below full strength impairs the people's business in that crucially important body." If Congress fails to act, the Supreme Court could - for the first time - have an empty seat for the better part of two terms, leaving us with a weakened judicial system. There are consequential issues coming before the Court, and any 4-4 decisions would have no value in establishing legal precedent on which future decisions and lower courts could rely. 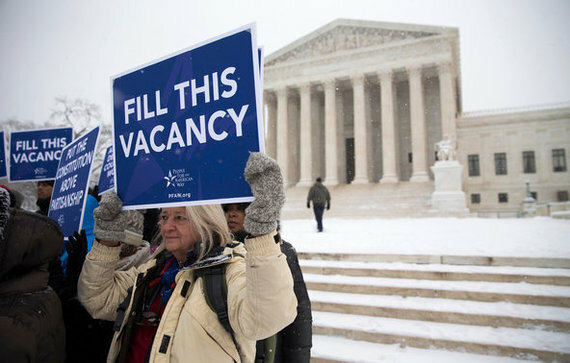 Filling a vacancy on the high court should be viewed as a solemn obligation, not as a political prerogative. In the words of President Reagan: "The Federal judiciary is too important to be made a political football. I would hope, and the American people should expect...for the Senate to get to work and act." Sadly, partisanship and rancor in Washington too often interfere with the work at hand and the greater good of the nation. This is a time when Congress needs to rise above the rancor and do its job. And it has plenty of time to do it: since 1975, the average time from nomination to confirmation is 67 days; the Senate has almost a full year to consider and confirm a nominee. Refusing to do so would be an unprecedented dereliction of duty. Last week, Former Supreme Court Justice Sandra Day O'Connor, a Reagan appointee, summed it up best: "We need somebody there now to do the job, and let's get on with it."